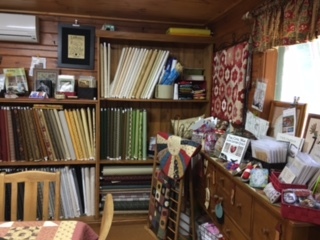 Welcome to my little quilt shop, it may in fact be the smallest quilt shop in Australia, but it's still worth a visit. l am open Tuesday, Wednesday and Thursday from 9.00am - 4.00pm. I run Sewing Circles here each week. To see what's happening take a peek at the Newsletter. I write a new edition at each month. Another way of finding out what's going on is to check the calendar, this also published each month. On the days l am closed l could be out visiting quilt shows or patchwork groups. If you'd like MMQS to visit you please email me. If the date's free and you want me, l'll be there. Of course my on line shop is open every day, visit website to find out what's in stock.